Your PC based Data Acquisition System (DAS) could cause failure of your testing program. When confronted by dust, high or low temperatures, moisture, or even rough handling, a typical DAS will fail. 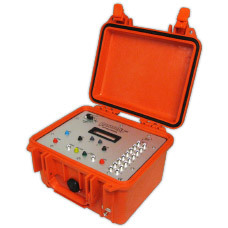 If you want to record acceleration, pressure, and other dynamic sensors under tough outdoor conditions, then the DataTrap II™ Data/VOD Recorder is the only rugged recorder that provides this capability and the optional ability to record dynamic strain, and explosives velocity of detonation (VOD) continuously along explosives columns in multiple blastholes, along explosives samples, as well as to determine the delay times between blastholes.